Even as the Massachusetts Bay Company was establishing itself in New England in 1630, another London-based joint-stock company, the Providence Island Company, was beginning its settlement project on a small Caribbean island off the coast of Nicaragua. The Providence Island Company was also led by Puritan gentlemen, such as the Earl of Warwick, Lord Saye and Sele, and Lord Brooke. Such men were wealthier and of much higher social status than most of the Massachusetts Bay Company members. There was some overlap between the two companies, and the leaders in the two groups were well acquainted with one another. The Earl of Warwick, as president of the Council for New England, had been instrumental in obtaining the patent of the New England Company in early 1628. Four years later, Warwick arranged for a patent to be granted for erecting a settlement at the mouth of the Connecticut River, and among the patentees were Sir Richard Saltonstall and John Humfrey. 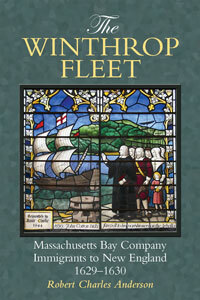 This was the basis for the establishment of Saybrook, under the immediate leadership of John Winthrop, Jr. In 1635, the Christian set forth for New England; most of its adult male passengers were carpenters hired by Sir Richard Saltonstall and bound for Connecticut. Their new settlement was meant to be erected on the same site already chosen by some newly arrived inhabitants who had come from Dorchester, Massachusetts. This contested spot would become the town of Windsor. Saltonstall’s carpenters and their families were allowed to remain, but Saltonstall’s personal colonization plans were frustrated. Although John Humfrey – from 1632 the brother-in-law of the Earl of Lincoln – did finally migrate to Massachusetts in 1635, he was never really comfortable there. Maintaining his ties with the leaders of the Providence Island Company, he managed to get himself appointed governor of the island in 1640, and attempted to siphon off some of the population of Massachusetts Bay to go with him. The effort ended in total failure; by the time Humfrey was ready to make the move to the Caribbean, the Spanish had taken over Providence Island, and this adventure was over. A common thread here is the desire of such men as Saltonstall and Humfrey to maintain their authority, to associate themselves with projects organized in the top-down manner that they preferred. An element in the transfer of their allegiance to the Providence Island Company must have been their growing realization that as the Massachusetts Bay Company began to grow into its new form as the Massachusetts Bay Colony, they would no longer be able to reap the advantages of being at the top. Adapted from the introduction to The Winthrop Fleet.